User Editions of the HumanitiesCMD and ResourceMD now available. User Editions are for other people who need to access full functionality of the database product but cannot edit or make additions. The diagram shows the main computer where the Full Edition is installed. 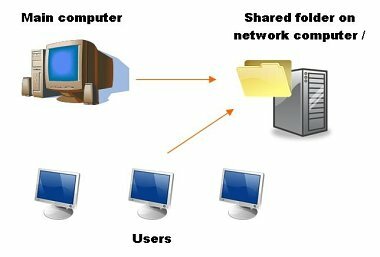 The data file is copied to a shared folder on a computer / server which the users access - each having the User Edition installed on their computers.